Viewing topic "OK, I’ll be the first to ask…"
First, I’m thrilled that the XF isn’t a radical departure from the XS as an XS owner. 2nd it looks as if it is QUITE Feasible to turn an XS into an XF. With the exception of the main board they appear to be about the same. What’s the possibility of upgrading an XS to an XF? With the possible exception of converters and the newer LCD, it looks like one could “Upgrade” it with a main board swap and a sticker to go across the User Bank Buttons since the rest of the layout has not changed. If it was kept reasonably affordable I’d be interested in this. I’m capable of swapping the main board out myself, but I realize that’s not for everyone. So what do ya say Yamaha? A Main board swap and a couple stickers to update the case for a couple hundred bucks? I’ll even send my board in to do it! ...or even a special XS upgrade deal ( swap ) for us loyal XS users ?? The XF is quite a bit different than the XF. Don’t forget that there are expansion slots for the flash memory boards, as well as 128 MB of flash memory on board. I don’t know that a main board swap would do it. I see your point, but having taken the XS apart (To fix the USB port) I know that everything that makes the XS the XS is on ONE circuit board. You can bet those Flash Slots are on the Same board. The only thing I think is questionable is if the D/A is on the output board (Though I don’t think that’s where the D/A is, not much going on there), and if the LCD Controller on the new board is compatible with the old screen or if that’s even an issue. good question - what I wanted to ask too, does XF means no more updates for XS users??? record of any of them offering an upgrade which turned a previous model into the next model. that means a new “XF for the XS” OS would have to be developed as well. this OS upgrade for the XS won’t turn it into an XF. Maybe not exactly the “Next model” but do you remember the “Turbo Boards” for the M1 and DX7 years ago. It’s not too far off from the concept. The K2000 series also had a pretty good history of non-obsolescence. I really don’t see how/why you’re separating the components. EVERYTHING, Meaning the OS, the samples, the memory was on ONE Circuit board on the XS. With only the addition of another memory chip or two and the flash slots, why would the XF be different? What is this “XF for the XS” business you’re talking about? Sans the mother board, and possibly the LCD screen, it’s almost the same machine. The differences are likely marginal at best. I HIGHLY doubt they’re writing specialized code for the newer LCD model being used. That would be a silly waste of resource for R&D;to have to re-write the display code for the screen. So chances are it’s backwards compatible. Same goes for the D/A. If we’d have to “Live” with the old D/A or screen, Big deal. Further, the case is most likely the same. Maybe an additional cutout would be needed to install the flash, but you’d just do that when installing the main board. Problem solved. There’s no way they’d retool the case to fit a new motherboard that can easily be made to accommodate the existing bolt pattern. That just doesn’t make economic sense. Even the Screen Printing is near Identical. One small sticker above the user banks would solve any issue there. Seriously a kit with 3 or 4 stickers total and the cases would be identically labeled. Obviously the “just buy an XF” is the solution Yamaha wants and the easiest one. For most XS owners, that’s probably NOT going to happen. Though for a reasonable price they MIGHT do the upgrade. Only Yamaha truly knows if it’s doable. Given my own experience with the innards of the XS and knowledge of programming, ASICs, Embedded systems and and computing in general is the ONLY reason why I suggested it. Because on the surface, it DOES appear quite feasible with very little hassle. Now if you’re saying that manufacturers can be greedy and are unwilling to do upgrades and want to force you to buy it, well yeah that’s typical and it’s their right to do so. But hey, one could be presently surprised once in awhile right? How many people would be jealous of us loyal Yamaha customers if they gave us an upgrade path like that on the cheap? I really think they should consider and look into it if they haven’t already. I understand the desire to have an XF - it’s cool. The way to get an XF is to buy it. Well, West, you not only want an upgrade path you want it “on the cheap”. Seriously man, it would be quick and dirty for you to sell your XS to someone that can’t afford a new XF and take that money, add what additional money you need to buy a new XF for yourself, and be done with it. In the last month I’ve read posts by players that “just bought an ES” which is now 2 generations old. So your XS is certainly a viable KB for somebody. I believe the work that would be required to provide an upgrade path to the XF from the XS would be quite a bit, and what they would recoup by selling and having dealers install such an upgrade would be a lot more than Yamaha could justify, even if it could be done. The profit margins on this equipment is not so high that they could be Santa Claus too. Sometimes reality doesn’t sit well but it is what it is. Whoa! Whoa! Whoa! Mr Sandcastlekicker. I was thinking the same thing as soon as I saw it. Its simple, NOBODY who has an XS is going to buy a new XF just for the flash, unless they were about to get a new board already(so no loss there). Now those “old” XS boards in stock are going to drop in price, or worse not get sold till they’re marked down three more times. How do you perserve value and recoup the drop in price while they are being phased out?, you ask. You offer Mod Kits at a price equal to cost of the pricedrop and mabey even add on couple more bucks labor if its sent in. I know i’d mod mine. hell, i’d send it in too if that was the only option or to get an official mod sticker(winks at yamaha). Yamaha it is beneficial for all parties involved for you to offer mods/mod kits and @the end of the day money talks but to notion of spending another $2.3k for flash is laughable. Hey Yamaha! lets get this money. To be honest, we seriously doubt that exchanging the main board of a Motif XS for an XF would be any cheaper than simply buying a new XF. If you look at Ebay there are still very few used Motif XS for sale. This moroning there was one Motif XS7 and the asking price was $1800. The price of a Motif XF7 will be about $$3099. So the main board, the cost of the services and the shipping fees to get it to a service center would need to be less than $1300 to make this at all viable ( you could sell your XS and buy an XF for $1300 outlay of cash) . We doubt that would actually work financially as the cost of replacing the main board very expensive. We are working on a Loyalty program in the US which will provide added value to people who upgrade. When we did this Loyalty program with the ES to XS, almost 1300 people took advantage of it the US. 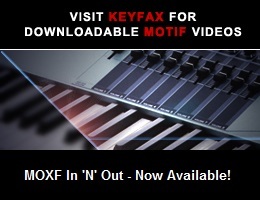 Will all the new internal waveforms, arps and voices for the Motif XF be available for the Motif XS ? Can you use new libraries for the Motif XF in the Motif XS ? Most of the libraries will be made in versions that support both products . Can you use the new software tools developed for the XF with the XS ? Can you turn your Motif XS into a Motif XF ? No, but we will release some new features from the XF for the XS including Tap Tempo, sampling UI improvements and others. good, that’s what I wanted to hear - tap tempo is a great thing to have. Actually, E-mu offered a factory upgrade option for every E-6400 or later unit (besides the E4K and E-synth keyboards) to the EOS Ultra level; they called it “Ultracizing”. The upgrade cost from $995 to $1395 though, in 1999 dollars. I think it is too easy to say that an xs owner can sell his XS on E-Bay or whatever and getting a good price for it. Forget it. Buying a new synth is easier than selling an used one. Believe me that does not work. I am happy with my XS8 and TYROS3 that is not the point, but telling people that introducing the XF will not have an effect on the value of his XS is simply not true. Changing or trading in an XS for an XF will costs a lot of money. and dont forget… your ES market is still there. Now go pitch that to your boss’s boss. Im trying to get u a raise here. Work with me. Grid sequencing will be the best option you can add to XS/XF.